Step 1: Apply a base color. Or if you already have nail polish on, you can just add a layer of top coat to have sticky surface. Do one nail at a time. Step 2: When polish is still wet, put your finger over something that will catch fallen beads. 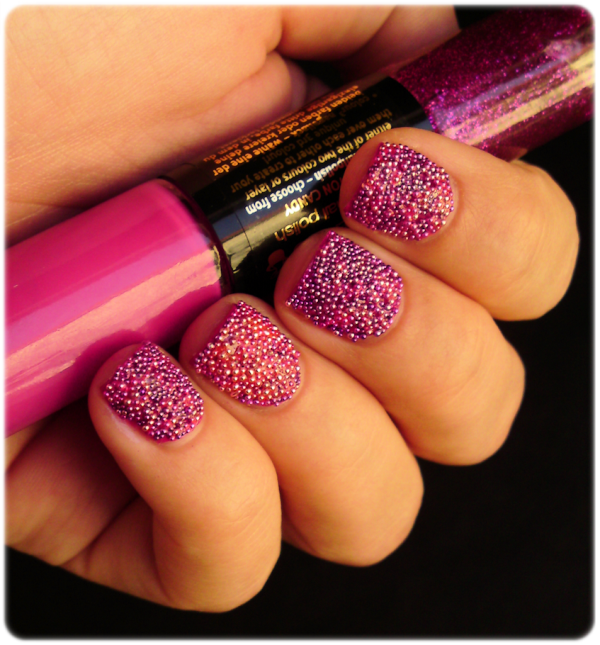 Sprinkle beads over your nail to cover the whole surface. Step 3: Gently push the beads down so they stick a bit more and you get rid of a beads that didn't stick to the nail. Step 4: Apply a coat of top coat to seal the beads and make them "long lasting". I was done in less than 10 minutes, but I only did my left hand. I'm sure I'll do a full manicure once in the future, because it's really easy to make it. My nails are super short, excuse me for that, but the final result looks funny and cute even on my nubs. :) So yes, no need to spend so much money on that set. :e You can mix as many color as you like so you're not limited with specific color combinations of beads, that's another plus! i really love this caviar mani, gorgeous colour mix!! That is very pretty! Is it hard to take off like glitter polish? Love the colors together! I wonder how long the little steel balls/pearls are going to stay on your nails. I'm liking this trend the more I see it, although I still think the texture and thickness would drive me crazy and I'd be picking them off within hours. I am trying to decide if I like the trend or not. I must admit yours so far is the cutest I've seen. Somehow, in the black colors (the two I have seen before) it looks too serious to be fun, and I think nail polish should be fun! Yours definitely is fun! Anyway, I'm in love with your manicure! Wow! I love it... It looks great! But I think that not too much practic for cleaning the house ect. :o))). Xoxo V.V. this is great Ivana! i love it! very very pretty! As I said on twitter, this manicure stole my heart ! This looks AMAZING babe! The best I've seen by far! LOVE LOVE LOVE, and one more LOVE just because its pink! Well thank you, I haven't heard about this "caviar" mani. 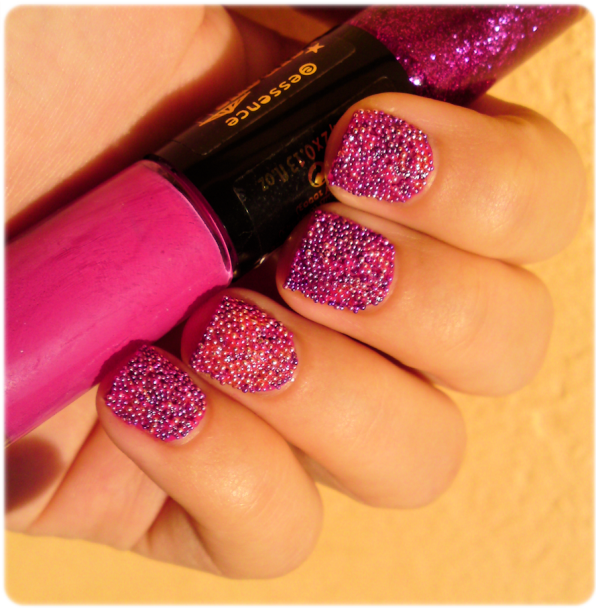 I think you did a beautiful selection of colors (pink :-)) and I love the result on your nails. Hvala :) Maybe I should try just on an accent nail first! Wow !! It is so beautiful !! I love the color. It is perfect, I don't know if they sell the beads in here, I am gonna look for them. This looks lovely, I really like the colour choice here! Ful lustno! in se strinjam, da je overpriced..
BTw, kako si naredila to, da vsakemu posebaj odgovoris?